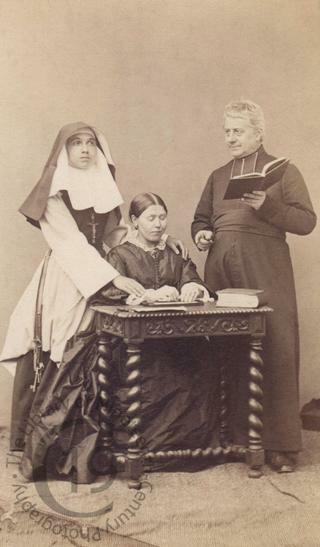 Canon [French: Chanoine] Peter Joseph Triest founded the Congregation of the Sisters of Charity of Jesus and Mary [French: Congrégation des Soeurs de la Charité de Jésus et de Marie] at Ghent in Belgium in 1803. The prelate on the right is possibly identified as ‘M. l’Abbé de Namur’ but the last word is rather hard to decipher. According to the inscription, the woman seated at the table is ‘Sourde – Muette – Aveugle’ [English: Deaf, dumb, blind]. Photographed by Jules Géruzet of Brussels [Belgium].